I’ve heard lots of crazy stories about how to deal with a horse that rears, and I’m sure you have too. I’ve heard of everything from whacking horses between the ears with sticks, busting a balloon filled with warm water over their heads, and making loud noises to get horses to stop rearing. Very rarely do any of these techniques work, and even if they do, they’re very short-lived. • He’s afraid. The horse is afraid and wants to run, meaning he’s using the reactive side of his brain. To make matters worse, the rider holds onto his mouth with two hands, making the horse feel claustrophobic. When this happens, the horse’s energy bottles up, and he can only release it by going up in the air or flying backwards and flipping over. • He’s balking. When he doesn’t want to do something, his way of getting out of it is to rear up or run backwards. Whatever the cause of rearing — whether he’s afraid or he’s balking— it shows a lack of respect. Make the horse understand that you’re the leader, and he needs to respect you. To gain a horse’s respect, you have to move his feet forwards, backwards, left, and right, and always reward the slightest try. When he’s moving his feet, he’s using the thinking side of his brain, and he is no longer fearful. The more changes of direction you do, and the more you make the horse move his feet, the more he’ll think and pay attention to you. • Curing a horse that’s afraid. The best thing to do is yield his hindquarters. When a horse crosses his back legs over one another, it takes away his balance point. Once his balance point is taken away, the horse can’t stand on his hind legs and rear. Disengaging a horse’s hindquarters is like pushing the clutch in on a car; you take the power away from the horse. Yielding the hindquarters also gets the horse to stop thinking about being disrespectful or fearful, and it makes him concentrate on where he’s placing his feet. 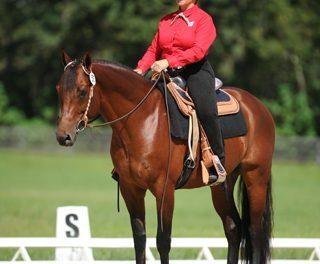 To yield the hindquarters, pick up one rein and pull it to your hip, bringing the horse’s head around towards your toe. Put your inside leg back (the same side as the rein) and apply pressure by the horse’s flank. Once the horse moves off of the pressure, take your leg off. Wait for the horse to soften to the rein, and then release the rein. • Curing a horse that’s balking at something. This is caused by a lack of control on the rider’s part. 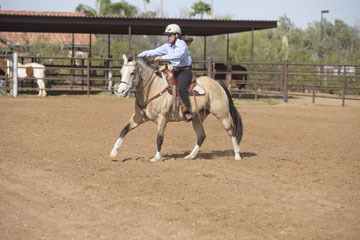 First, get control of the horse on the ground by moving his feet forwards, backwards, left, and right, and it’ll carry over to riding. If the horse rears because he doesn’t want to go somewhere, use a little reverse psychology on him. Don’t think, “How can I make the horse move?” Think, “How can I make it uncomfortable for the horse not to go in the direction that I want?” Do that by working the horse hard wherever he wants to be and letting him rest and relax where he doesn’t want to be. For example, if the horse wants to stay at the barn, then work him there. Work him hard and make him hustle his feet, but only use one rein to direct him. Do a lot of serpentines by bending the horse to the left with your left hand and left leg, or in the opposite direction. Serpentines are great exercises because the horse has to constantly move his feet and change directions. The more times a horse changes directions, the more he has to think and pay attention to you. Another good exercise to get a horse’s feet moving is by doing rollbacks. Not only do rollbacks make a horse’s feet hustle, but they also make him use his hindquarters. The hindquarters are the horse’s gas pedal. And the more control you have of the gas pedal, the more control you have of the horse. Rollbacks make a horse use his hindquarters and improve his responsiveness to your aids. When doing a rollback, canter the horse off, bring him to a stop, and roll him over his hocks. It doesn’t really matter how you move the horse as long as you hustle his feet. The horse wants to be moving, so either you do something constructive with his energy, or he’ll do something destructive with it. If you let the horse drag his feet and daydream about fairies, then the exercise won’t work. Make the horse hustle his feet, and give him a reason to want to get away from the barn or wherever he doesn’t want to leave. • Get off. If at anytime you’re riding a horse that rears and you don’t feel safe, immediately get off. On the ground you can longe the horse and do other groundwork exercises to gain his respect and get him to use the thinking side of his brain. Once the horse is listening, you can get back in the saddle. There’s no shame in getting off and moving the horse’s feet. A lot of people don’t like getting off because they feel that the horse gets a win. The horse only gets a win if you get off, rub him, and then walk him back to the barn and put him away. If you do that, then you’re only reinforcing his bad behavior. • Use one rein for control. When a horse panics and turns to the reactive side of his brain, control him with just one rein. If you’re tempted to grab onto both reins for control, grab a fistful of mane or the saddle horn instead. Put the horse on a loose rein, and redirect his feet with only one rein. Then concentrate on getting him to use the thinking side of his brain by doing lots of changes of direction. 1. The horse can be pulled off balance and over backwards. 2. The horse fights your hold on him. The more someone tries to make a horse behave and stand still by pulling back on two reins, the more upset and nervous the horse gets. That’s because pulling back on both reins makes the horse feel trapped and claustrophobic. Since the horse is a flight-or-fight animal, he either runs from danger or fights it; his only option is to fight your hold. A rearing horse is a horse with a lack of foundation. Go back to basics, and do more groundwork. Get the horse using the thinking side of his brain, and earn his respect. Rearing is a symptom of disrespect or fear. If it’s a lack of respect, get his feet to move. If it’s fear, do a lot more desensitizing and take away his fear. When you do these things, the problem should fix itself. 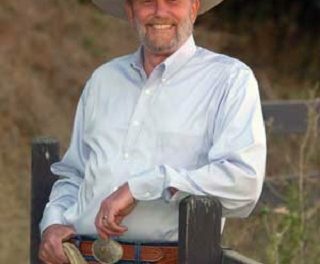 Through his widely-popular Downunder Horsemanship program, Clinton Anderson works hard to educate horse owners on how to be safe and effective while enjoying their horses. His training methods are easy to understand and are designed to help horse owners get the results they desire. Clinton holds clinics and can be seen on RFD-TV. This Australian native is a two-time champion of the rigorous Road to the Horse Colt Starting Challenge, which gives trainers just three hours to break an unstarted colt. Learn more about Clinton at www.downunderhorsemanship.com. 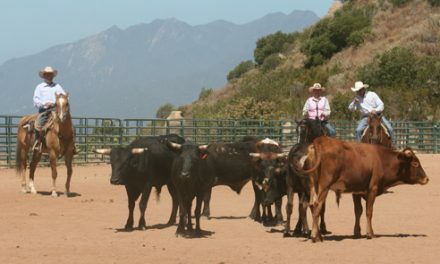 Are You Ready For A Horsemanship Clinic?